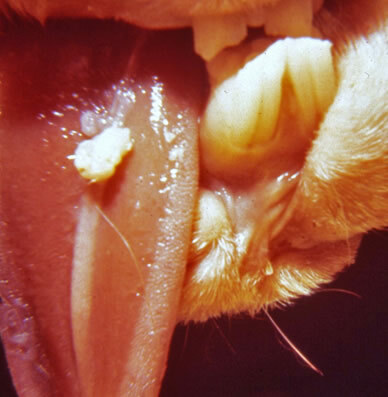 Etiology: Rabbit oral papilloma virus is a member of the papovavirus group (DNA virus). It is not related to the rabbit (Shope) papilloma virus. Incidence: There is moderate incidence of disease. Transmission: Spread is thought to be through direct contact. It is believed that oral abrasions are needed for infection to occur. Clinical Signs: This benign disease is seen in rabbits 2 – 18 months of age. There are numerous small, whitish verrucous growths on the underside of the tongue and occasionally in the oral cavity. Papillomas spontaneously regress within a few weeks. Pathology: A typical papilloma with verrucous epidermal hyperplasia with rete peg formation and hyperkeratosis and dermal fibroplasia has been described. Intranuclear basophilic viral inclusions can be observed in the stratum spongiosum of the epidermis. No malignant transformation has been documented. Diagnosis: The gross lesions are diagnostic.